So the UPS guy had quite a struggle the other day. It was the big 50lb box that we’ve been waiting for. Something to make all that fence we have to build go a little bit smoother. A very fancy new post driver. Now we already have two post drivers, but this one is a bit different. It’s a propane-powered post driving maniac. 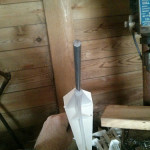 You see, we like using well drill pipe for our fence corner and gate posts. 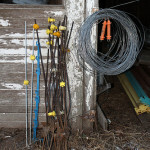 Drill pipe is priced similarly to treated wood posts, but it’ll probably last longer, and because you can weld braces (and gate hinges) on, it makes stronger fences. 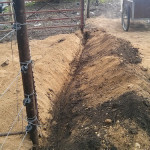 Plus, if you drive them into the ground you can string up wires right away, which speeds up the fence-building process quite a bit. The big problem with drill pipe is driving it in the ground. Driving it with a normal t-post driver isn’t exactly a possibility. Tractor-mounted fence post drivers are too expensive and too hard to find. 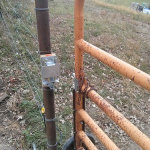 There are hydraulic fence post drivers, but they require a separate hydraulic power source (expensive). 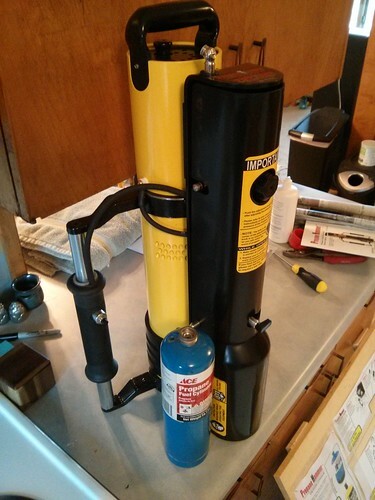 Pneumatic fence post drivers look like a pretty good option, as they’re cheap and only require a gasoline-powered air compressor to run them. The problem is that the ones I’ve seen only fit one narrow range of post size. 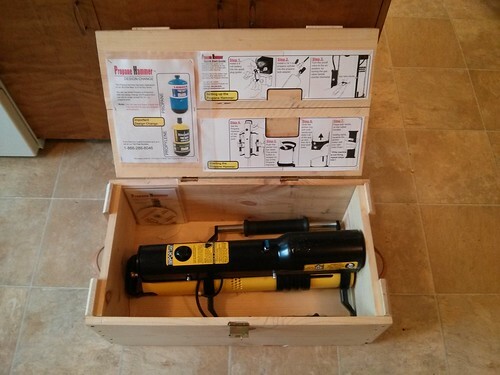 You’d have to own several pneumatic post drivers to have all your post sizes covered. That left us with the Tippman propane hammer. 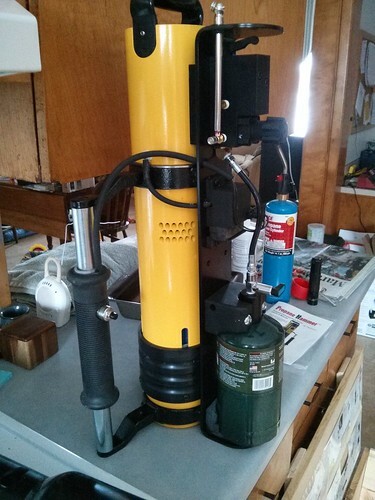 It uses little propane cylinders, which are easy enough to find, and they claim that it’ll drive darn near anything under 3.5″ in diameter, right down to 1/2″ grounding rods. So we got the propane hammer in and unboxed, and quickly noticed a bit of a problem. All the material we’d seen showed that it used the standard 14.1oz propane tanks that your normal propane torch uses. This was obviously not the case any longer. They apparently saw fit to change the whole thing to only use 16.9oz propane tanks, which are apparently a new thing in the propane-torch world. 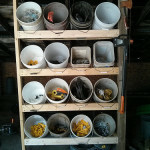 I’ve never seen them before, but since we needed them to use the post driver, it was off to the hardware store. Turns out no hardware stores have these mythical 16.9oz propane tanks. The 14.1oz tanks are everywhere, but they’re too tall to fit in the redesigned post driver, so we’re stuck looking in vain for the new “fat boy” tanks. Fortunately, we found out that a standard Coleman camp-stove 16.4oz propane tank works just fine. This is actually makes the redesign a good thing, because every sporting goods store is just filthy with the Coleman tanks, and they’re usually dirt cheap. It sure would be nice if Tippman went ahead and told you up front that the 16.4oz tanks will work. Anyway, after finding the right propane cylinders and adjusting the pressure, it was time to take it out in the field and see if it would actually work. 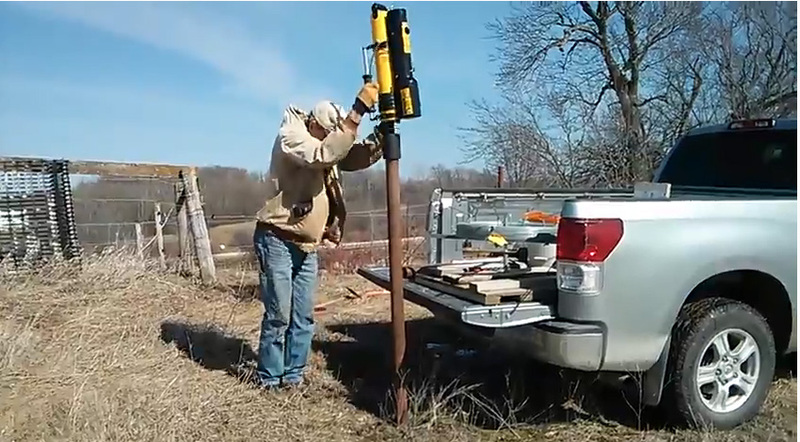 I’ve seen video of the pneumatic post-drivers pounding in a drill-pipe, so I was fairly sure the propane hammer would work, but you never know until you try it. It worked out pretty darn well. Hello SO how has it worked over the long haul … Are you a believer. Its a whole lot of money for a driver….. Is it vastly better than using a 35 lb hammer demo breaker? The Tippman’s long-term durability leaves a lot to be desired. The pressure regulator is the big problem. It seems that it gets knocked out of whack by the vibration quite often. Most of the time you can get by with fiddling with the dial a bit, but the regulator has started leaking on us at least 3 times, necessitating a complete tear down or replacement of the regulator.